What is the Castle Phoenix Trust? The Castle Phoenix Trust is a growing multi-academy trust which was founded in February 2013 on the success of the Caludon Castle Teaching School (the original trust member). Currently there are 5 schools within the Trust – Caludon Castle School (Coventry), Kingsbury Secondary School (Warwickshire), Foxford Community School (Coventry), Hill Farm Primary School (Coventry), and Richard Lee Primary School (Coventry). The Trust specialises in ‘Leadership’. Leadership development underpins all of our work. We believe that most school processes - change, talent, teams, engagement, innovation, collaboration – stand or fall on the quality of leadership. All our leaders are unique and there is not an ideal character for leadership. We want all our leaders to develop emotional intelligence and deepen their knowledge skills and leadership attributes to be effective. 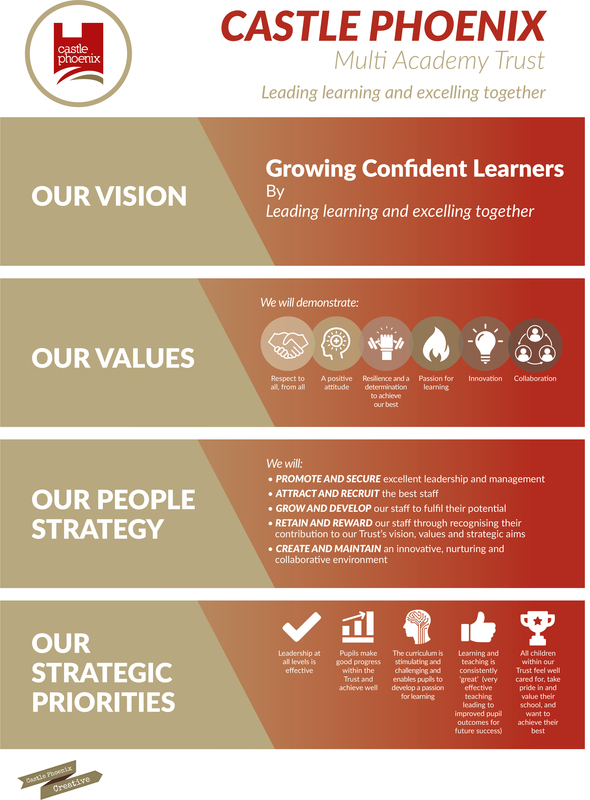 We develop leadership capacity at every level, building self-awareness, confidence and initiative; we work with the talent that is in every school for future leadership and we support the development of a leadership culture. This includes developing student leaders. The best future leaders are probably already in our schools. There is no better way to ensure our Trust stays effective than by challenging, nurturing and enabling our most talented staff.